Plump, sweet blackberries grow wild across most of North America and are a good source of manganese and tannins. The blackberry is actually an ancient fruit that was once prescribed by the Ancient Greeks for gout and commonly written about in British folklore. Wild blackberries are soft, juicy fruits that grow on thorny bushes or trailing vines. Did you know that blackberries were ranked fourth in laboratory tests as being one of the fruits that are rich in antioxidants? The natural antioxidant or ‘phenols’ in blackberries have been found to have antioxidant properties comparable to fresh grapes and red wines. Scientific research also indicates that blackberries were tested as having the highest effect on reducing the LDL or “bad” cholesterol in the body. 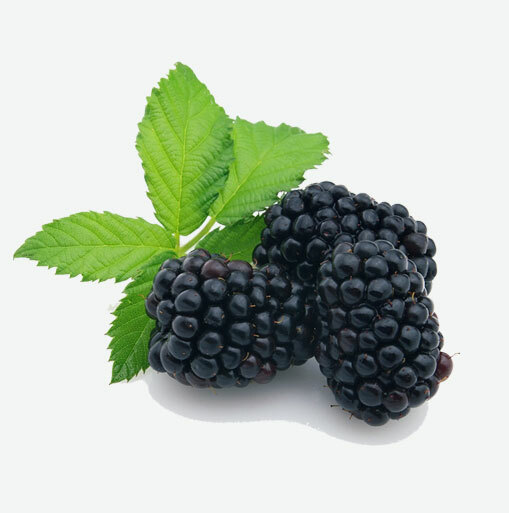 Blackberries are considered to be an astringent because of their high tannin content. Studies show that tannins tighten tissue, lesson minor bleeding, and may help to alleviate diarrhea and intestinal inflammation. German health authorities recommend blackberries for mild infections including sore throats and mouth irritations. Choose blackberries that are moderately firm, plump, dry, and uniform in dark purplish-black color. Fresh blackberries are not always readily available in stores because quality is lost during shipping. When purchasing, be sure to check the bottom of the blackberry container to ensure that there are no moldy or crushed berries. Blackberries are among the most perishable of fruits; they can turn soft, mushy, and moldy within 24 hours. Blackberries are best used the same day that they are purchased. When you bring home a box of berries, turn it out and check the fruit. Remove soft, overripe berries for immediate consumption; discard any smashed or moldy berries and gently blot the remainder dry with a paper towel. Spread the berries on a shallow plate or pan and cover with paper towels, then with plastic wrap. Blackberries will keep for about 2 days. Although blackberries have a short season and are highly perishable, they freeze quite well, allowing you to enjoy them practically year round. Freezing berries yourself is simple. Place berries (wash and dry only if necessary) in a single layer, slightly apart on a cookie sheet. Place the berries in the freezer until they are solidly frozen, and then transfer them to an airtight container or heavy plastic bag, seal tight, pressing out all air, label and date. They will keep for 6 months. Serve fresh blackberries as they are, drizzled with honey or tossed with a little sugar. Or make a fruit salad with a combination of berries. Blackberries are also delicious in pies, tarts, or cobblers. Use fresh or frozen berries in cooked desserts. When using frozen blackberries in pies, tarts, and cobblers, there’s no need to thaw. Fresh or frozen blackberries may be used for jams. If using fresh berries, keep a few un-ripened berries in the mixture as they help to set the jam.